I returned from my recent trip to Barcelona incredibly inspired by the food I had enjoyed there. There were many dishes I wanted to recreate, and decided to plan an ode to Barcelona in the form of a tapas party for my family. There are many dishes from our trip that didn't make it onto the menu simply because I had to limit the number of dishes, but I hope to try some of the others in the very near future. This is the menu I came up with for the occasion. I purchased a variety of Spanish cheeses from Whole Foods including 6 month aged Manchego (sheep's milk cheese), Capricho de Cabra (soft goat's cheese), and Drunken Goat (aged goat's cheese with edible red wine rind)--the latter two are from the same cheese maker. I also was able to procure Serrano ham there as well (I later found some at Aldi as well). Although it's from a different breed of pig, and not nearly as amazing as jamón ibérico, it's the best I could do with my resources stateside. It reminds me a bit of prosciutto. The jumbo green olives were pre-stuffed with sun-dried tomatoes, and were purchased from the World Market section at Bed, Bath, and Beyond. The pan con tomate doesn't really require a recipe, although I shared one years ago in another post. When we were in Barcelona, we ate this tapas dish more than any other, and everywhere it was made with different types of bread. On this occasion I used ciabatta bread, split and light toasted, rubbed with fresh whole garlic cloves, halved tomatoes and a light drizzle of extra-virgin olive oil. So simple and so incredibly good! I also made some gluten-free pan con tomate on gluten-free baguettes for my nephews! I'll share a few of the other recipes for the sangria, escalivada, and gambas al ajillo in another blog post but today I will focus solely on the bombas. Bombas were actually invented at La Cova Fumada in the Barceloneta neighborhood of Barcelona. You may recall from my Barcelona blog posts that I had planned lunch one day in Barceloneta but had to change my plans last minute. Well, my plan was to eat at La Cova Fumada, the birthplace of these famous potato bombs, but that unfortunately didn't happen on this trip. I still managed to eat bombas on two other occasions in Barcelona, and it was so memorable that I absolutely had to try making them myself at home. Our favorite bombas from the trip were filled with stewed beef, but the more traditional version uses ground meat as the filling. I compared a lot of recipes to figure out the best way to approach this dish, and I actually ended up making twice as much filling and twice as much bravas sauce than I needed, so I scaled those portions down for the recipe below. I actually froze my remaining bomba filling so I can easily make another batch of bombas in the future. I yielded 21 bombas, but small discrepancies in measurements, or depending on how much you peel your potatoes may fluctuate that number a tad. You'll just want to aim for about 1/4 cup potato and 1 tablespoon filling per bomba. Using a measuring cup and spoon will save the day and yield more accurate and evenly sized bombas. Although there are a number of steps, the recipe is actually not very difficult. It just requires a bit of planning and patience, but the different components are quite easy to make and the bombas themselves are pretty easy to assemble as well. I was worried shaping them would be messy, but it wasn't too bad at all. I used a deep fryer to cook these, which I highly recommend since it keeps the oil temperature steady, and doesn't make a huge mess on my stovetop. They fry very quickly, at only about 2 minutes each. My next post will feature more recipes from this tapas feast but first here's a bonus! I used some of my leftover bravas sauce and allioli from the bombas recipe to make what I'm calling "trashy" huevos cabreados, or angry eggs. Huevos cabreados were one of my favorite discoveries in Barcelona. 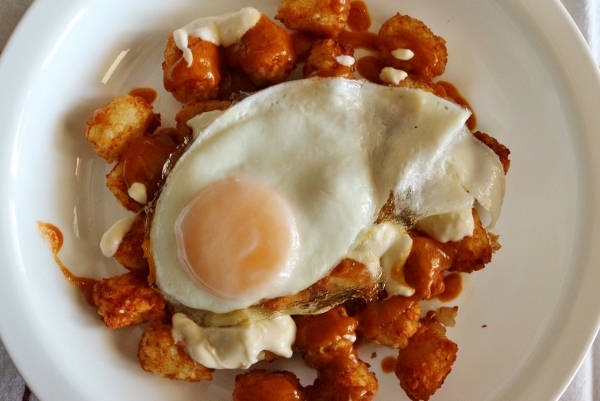 We really didn't know what to expect, but were floored by how much we loved this dish of french fries, bravas sauce, and allioli topped with a fried egg which was sliced table side and tossed together. 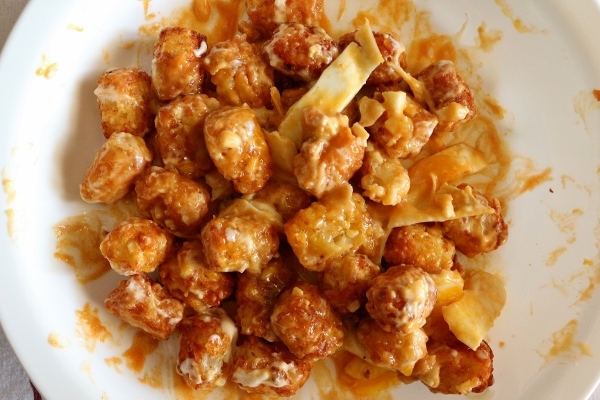 I recreated it in the trashiest, most American way possible: with frozen tator tots baked until crisp in my toaster oven. This was a super easy rendition of the original, and I didn't even need to heat up my deep fryer or slice a single potato into matchsticks. 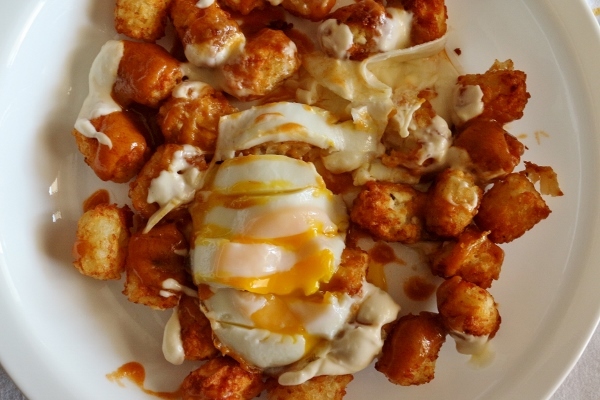 I just drizzled the two sauces over the top of my tator tots, finished with the egg, and viola! To make the allioli: In a small saucepan combine the garlic cloves and olive oil and bring to a simmer over medium heat. Cook for 5 to 7 minutes, or until the garlic is tender and honey gold (occasionally tilt the pan as needed to keep the garlic submerged--even off the heat the olive oil should be hot enough to keep cooking it). Watch the garlic carefully so that it does not overcook. Life the garlic cloves from the oil with a slotted spoon and set aside on paper towels to cool. Reserve the garlic oil for another use (1 tablespoon will be used later for the allioli). In a small food processor fitted with the metal blade, puree the garlic cloves, mayonnaise, lemon juice, and 1 tablespoon of the garlic oil. Taste, season with salt, and pulse to mix. Scrape the allioli into a lidded storage container and chill for up to 3 days. You should have about 1 cup allioli. To make the filling: In a large non-stick skillet heat the olive oil over medium-high heat. Add the ground beef and pork, and cook, breaking the meat up into small pieces with the edge of a wooden spoon, until no longer pink and most of its natural liquid has evaporated. Add the grated tomato, paprika, garlic, salt, and cayenne and continue cooking until the remaining liquid has absorbed/evaporated. Set aside to cool completely. To make the potatoes: Add the cubed potatoes to a pot and cover with cold water by at least an inch. Salt generously and bring to a boil over high heat, being careful it doesn't boil over (lower the heat as needed). Boil the potatoes until they are easily pierced with a fork, drain and then return to the pot off the heat. Add the olive oil and mash the potatoes with a potato masher until smooth. Adjust seasoning if needed. Let the potatoes cool slightly and then mash in the egg (you don't want the potatoes super hot or else the egg will cook). Set aside to cool to room temperature. To assemble the bombas: Scoop 1/4 cup of the potato mixture at a time into the palm of your hand. You can slightly wet your hands as needed if the potato starts to stick to your hands during this process. 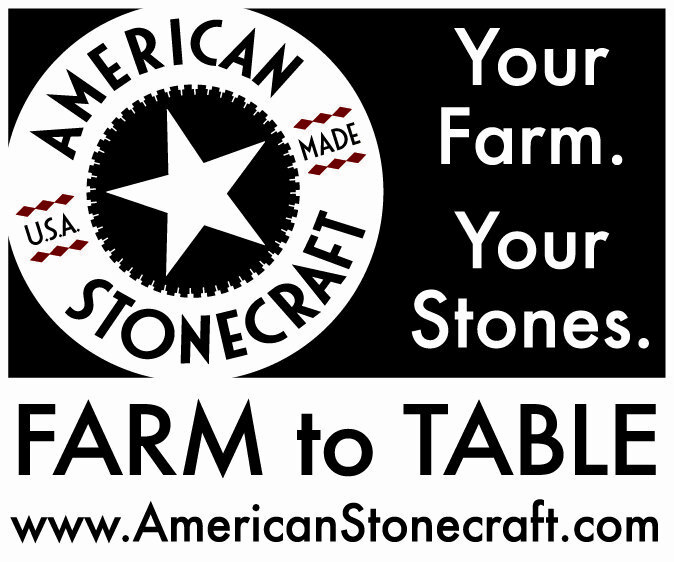 Carefully pat the scooped potato into a disc about 1/2-inch thick in the palm of your hand. Add 1 tablespoon of the cooled meat filling into the center, then carefully cup your hand to start bringing the edges of the potato together and use your other hand to pinch it closed. Smooth into a round ball and set aside as you continue shaping the remaining bombas. The bombas can be refrigerated at this point until you are ready to bread and fry them. To make the bravas sauce: Heat the olive oil in a small saucepan over medium-high heat. Add the flour and paprikas and whisk for a couple minutes to ensure the flour starts to cook. Slowly add the chicken broth while continuing to whisk into a smooth sauce. It will thicken more once the mixture comes up to a boil. Season with salt and cayenne pepper. This sauce can be served hot, warm, or room temperature. To finish the bombas: To each of 3 wide bowls add flour, beaten eggs, and dried breadcrumbs to set up a dredging station. Dredge each bomba one at a time in the flour, then the egg, then the breadcrumbs, and set aside on a clean tray or work surface until remaining bombas are breaded. You can also bread them in batches as you fry them, but this can get messy. Heat the vegetable oil in a deep fryer or Dutch oven to 350 degrees F. You'll want the oil to be deep enough so the bombas will be fully submerged once you add them to the oil. Fry the breaded bombas in batches for about 2 minutes each or until they are golden brown. If you fry them much longer the balls may start to crack open. Set finished bombas aside on a paper towel-lined tray or sheet pan to drain. Serve bombas immediately with the allioli and bravas sauce.